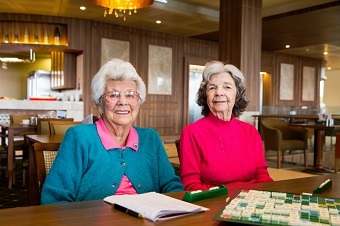 GPs are reminded that two newly commissioned services: Social Work Service to Support GPs is available for suitable patient referral by a GP, while The Hospital Discharge Follow Up Service for People with Dementia (hospital to home) is a hospital referred service to support your patients being discharged home safely. These local services have been designed to reduce the likelihood of admission or re-admission to hospital. Read about the individual services and how to refer below. 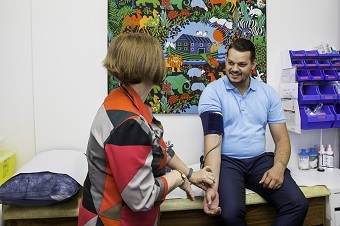 The funding provided to PCCS will allow the organisation to run a GP Social Work Support Program in Hornsby, Ku-ring-gai, Ryde and Hunters Hill, which adopts a patient-centred medical home approach to supporting the health, social and welfare needs of patients. The model works alongside a GP’s normal model of care, and provides social work services in the community to assist patients to improve their health and wellbeing, better navigate the system, access needed support, and avoid unnecessary hospitalisations. Social workers will support GPs and their patients by facilitating and coordinating additional assistance, for example liaising with social, welfare and community providers. Access to timely and effective social work services is key to helping people stay Healthy at Home. CCNB will deliver this model through the provisions of a mobile team of experienced and qualified social workers who will work flexibly across the LGAs of Willoughby, Lane Cove, Mosman, North Sydney, Manly, Warringah and Pittwater. CLICK HERE for the SNPHN instructions on importing templates into Medical Director. CLICK HERE for the SNPHN instructions on importing templates into Best Practice. Kincare is an organisation that provides in-home health and wellbeing services to older people and people with a disability. SNPHN is commissioning Remember Me, a dementia-specific hospital discharge pilot project. The primary goal of the project is to facilitate the smooth transition of a person living with dementia from hospital to home. It also aims to reduce re-admissions to hospital, and to ensure all parties in the client’s support network are kept up-to-date through maintaining and improving communication. KinCare’s services are person-centred, flexible and responsive to changing needs. JBC is one of Australia’s leading supplier of in-home support, enabling people to live independently, maintain their personal and social connections and enjoy a better quality of life. Stay at Home is a hospital discharge pilot project for people with dementia or suspected dementia who are being discharged from hospital and are at risk of re-admission. The project will provide participants with assistance through case management to link into services, supporting them to live as independently as possible in their own homes. A key component of the service is to ensure the patient’s GP is kept well informed of the discharge plan. For more information, please contact the Primary Care Team. The Practice Incentives Program (PIP) is a key driver of quality care in the general practice sector. 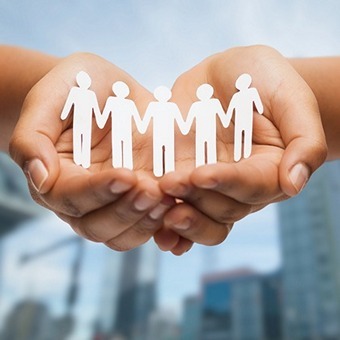 The redesign of the PIP is an Australian Government initiative to simplify the current PIP and to introduce a new Quality Improvement Incentive. This will give general practices increased flexibility to improve their detection and management of a range of chronic conditions, and to focus on issues specific to their practice population. We look forward to receiving your valuable input to this important consultation process to ensure your views contribute to the innovative and collaborative redesign of the PIP in the support of quality health care. If you are interested in Quality Improvement and have the CATPlus Tool installed at your practice, SNPHN will provide you with a payment of up to $1000.00 if five Plan Do Study Acts (PDSAs) are completed by 30 June 2017 – this equates to $200.00 per completed PDSA. If you do not have CATPlus installed and would like to participate in quality improvement, we can arrange to have the tool installed. A temporary amendment to the ePIP incentive has been made by the Department of Health to allow general practices participating in the program to upload all shared health summaries required to meet targets to the My Health Record by January 31 2017. Only registered and enrolled nurses who are currently working in Australian general practice are eligible. What is the aim of Advance? 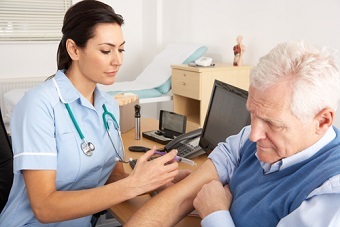 increasing confidence and comfort levels for general practice nurses (GPNs) in initiating conversations with patients and their carers about screening for supportive care needs and ACP. Why nurses in general practices? General practices provide ongoing care for a large number of patients with chronic, debilitating and eventually fatal diseases, both malignant and non-malignant conditions. Thus general practices have an essential role in providing palliative care to patients and their families. GPNs play a key role in patient management within general practices. GPNs are already involved in managing patients who are at risk of deteriorating health and dying. 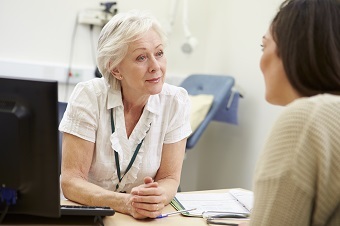 Given their ongoing relationship with patients and carers and the level of trust developed, GPNs may be ideally placed to help such patients identify their most important symptoms, concerns and priorities that they would like addressed by their GP. How is the training funded and delivered? The program is available free of charge for nurses working in Australian general practice. Advance is funded by the Australian Government Department of Health and will be delivered by a national consortium. 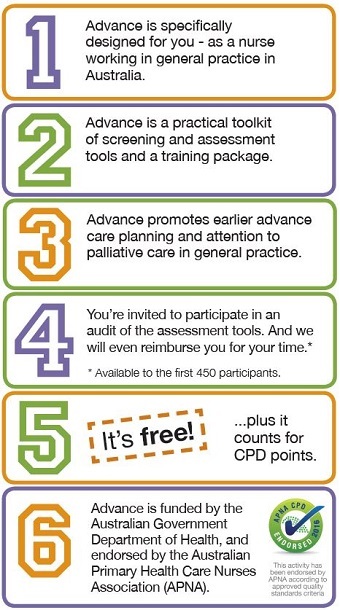 There is free online training, free face-to-face workshops, free one-to-one tele-mentoring from an experienced palliative care nurse, sponsorship for completing patient assessments, and more. The training will count towards your GPN’s CPD requirements. How much time will it take a general practice nurse to complete the training and where will the training be delivered? The online component of the training package will take about two hours in total to complete. The free practical workshops will be held on weekday evenings in every capital city of Australia for approximately 3 hours. Scholarships will be made available for GPNs from rural/remote settings to assist with their costs to attend the workshops. You can find out more about Advance here. A practical workshop is being held on Thursday 27 October at Ku-ring-gai Gordon library for nurses working in General Practice. The workshop is on “Initiating palliative care and advance care planning”. The National Asthma Council Australia launched version 1.2 of the Australian Asthma Handbook, developed by an interdisciplinary team of medical experts and incorporating feedback from primary care providers. Implementation of treatment plans for asthma will get easier for GPs, with the updated Handbook clarifying facts on the latest medications on the market for asthma and chronic obstructive pulmonary disease (COPD). If you would like an in-service presentation to your practice, please contact CCNB by email at ccnb@ccnb.com.au or by telephone on 1300 002 262. The RACGP has produced the RACGP female genital cosmetic surgery guide for general practitioners and health professionals, which is free to download from the RACGP guidelines website .